Storms come and go but they often tend to leave significant damage in their wake. A yard with toppled trees is not just an eyesore but is also a danger to the people living there. Therefore, you should not wait a long time before going in for tree stump removal. Hunter’s Tree Service is here to provide the residents of Bonney Lake with the best in tree removal services. If you have a tree stump that needs stump removal or stump grinding and are looking for professional services, then we are the ones to call. 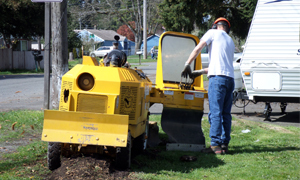 With a large number of storms taking place on quite a regular basis, Bonney Lake residents never know when you could end up requiring our stump removal services. Let us take care of any damaged trees on your property. You may think it is alright to leave damaged trees on your Bonney Lake property as they are not harming anyone. Well think again, damaged trees and stumps can cause a lot of damage to your structure, or to even to the safety of your family. 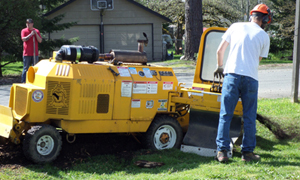 To protect you from the following problems, you should seek immediate stump grinding and stump removal services to get rid of any excess wood on your Bonney Lake property. As you can see, keeping dead and rotting wood can be safety hazard. Let the professionals at Hunter’s Tree Service provide excellent tree removal services! We provide the finest in tree removal services to homeowners in Bonney Lake, including stump grinding and complete stump removal. Whether you have a tree that has been damaged in a recent storm or a dead tree that is rotting away and reducing the beauty of your Bonney Lake yard, all you need to do is call and we will be there to take care it. With a highly qualified staff that is equipped with the best equipment required for tree stump removal and stump grinding, Hunter’s Tree Service provides tree removal services that are bound to impress Bonney Lake residents. At affordable prices, this is the best step one can take for maintaining their yard. Call us today.